The Chinese president faces "the opposition of regional administrators": serious unemployment problems could result in street protests. The favoritism and "purges" that Xi operated in the Armed Forces are a cause of resentment among army officers. Intellectuals irritated by the "fierce control" on freedom of expression. Economic alarms undermine Xi's popularity among the Chinese bourgeoisie. Hong Kong (AsiaNews) - The power of the "supreme leader" is not challenged by the attacks of US President Donald J. Trump, but rather the increasingly numerous enemies within the national borders. Discontent towards the choices of government adopted by Xi is mounting among those nostalgic of the policies of Deng Xiaoping, regional administrators, the military and intellectuals. This is the view of Prof. Willy Wo-Lap Lam, professor of Chinese University in Hong Kong and author of several books on China. We propose below the second part of its analysis. Here you can find the link to Part I. Courtesy of the Jamestown Foundation. It is perhaps with the goal of pacifying major party clans who still favor Deng-style reform that Xi convened a grandiose late-November meeting in Beijing to commemorate the 120th birthday of the late state president Liu Shaoqi (RFA, November 26, 2018). While Liu perished in 1968 due to Mao Zedong’s persecution, he and Deng were close comrades-in-arms in pushing forward market-oriented liberalization. In Xi’s eulogy of close to 7,000 characters, the Liu-Deng connection was not mentioned. Nor did Xi highlight Liu’s struggles with Mao regarding whether the CCP should introduce a fully state-dominated economy in the 1950s and early 1960s. Xi instead dwelled mainly on Liu’s moral qualities as a Communist Party member, including his view that all party members should unquestioningly follow instructions from the zhongyang (中央) or top party leadership (Wenweipo.com [Hong Kong], November 24; People’s Daily, November 23). It is instructive to compare Xi’s address with that of ex-president Hu Jintao at the celebration of Liu’s 110th birthday in 2008. In his speech, Hu noted that the “major contradiction” in society is not ideological conflict but “people’s demand for the speedy development of the economy and culture.” Hu cited Liu as urging that the state must “fully make use of the free market and to use the law of prices to regulate production” (People’s Daily, November 12, 2008). It is therefore doubtful whether Xi’s celebration of Liu’s contributions could win him the support of Deng’s followers. Xi is also facing opposition from regional administrators who fear the trade war’s potential to exacerbate unemployment. Serious employment problems could translate into street protests, which would adversely affect local-level cadres’ chances for promotion. 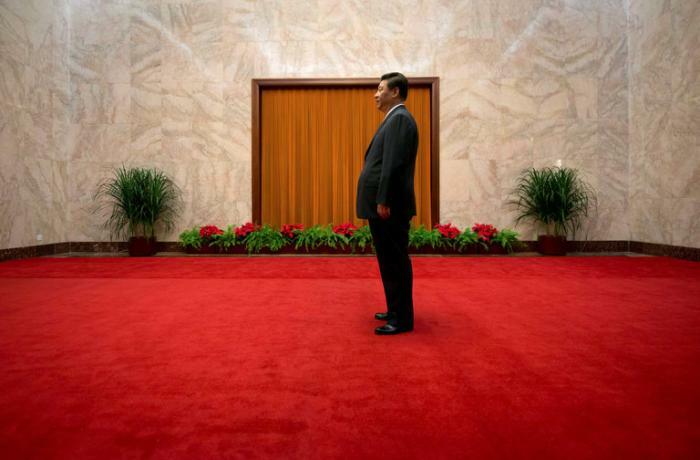 Some analysts believe that Xi’s unpopularity among regional officials could be one reason why he has decided not to convene the Fourth Plenum of the Central Committee this year (Apple Daily, November 5). A November plenum to discuss the Sino-US trade was has been widely anticipated, but a good proportion of the Central Committee’s 204 full members and 176 alternate members are senior cadres from the provinces and cities (Hong Kong Economic Times, October 22; HK01.com, October 16). And while in the run-up to the 19th Party Congress, Xi devoted his attention to securing slots for his protégés and allies in the more exclusive Politburo and its Standing Committee, the Central Committee still contains a number of members of the Communist Youth League Faction founded by ex-party secretary Hu Jintao (BBC Chinese, October 15, 2017). If a plenum were called, Xi could face questions from Committee members about his ability to fight the new Cold War now brewing between China and the US. It is also significant that several sycophantic regional leaders who owed their promotion to Xi—for example, the party secretaries of Tianjin, Beijing and Shanghai (Li Hongzhong, Cai Qi and Li Qiang, respectively)—have been strangely reticent to heap praise on Xi’s recent handling of domestic and foreign policy. In fact, Li Hongzhong has virtually disappeared from official media since the National People’s Congress last March, while Li Qiang has not appeared in national party media since last July (Xinhua, July 22; Xinhua, March 15). As a student of Mao, Xi is fully conversant with one of the Great Helmsman’s most cited dictums: “Power grows out of the barrel of a gun.” Xi, who is also Chairman of the Central Military Commission (CMC), has shaken up the PLA’s command-and-control apparatus through a thoroughgoing restructuring from December 2015 to January 2016. The commander-in-chief also took advantage of the shake-up to install his own protégés in key positions at the headquarters level, while masterminding extensive purges amongst the followers of two former CMC vice-chairmen, Generals Guo Boxiong and Xu Caihou (Xilu.com [Beijing], August 15). Since last year, the Xi has also tried to sideline associates of two important Hu Jintao appointees, former Chief of the General Staff General Fang Fenghui and Chief Political Commissar General Zhang Yang (Liberty Times [Taipei], October 16). Given the traditional cliquishness among the PLA, he has managed to offend four camarillas in the military forces. It also doesn’t help that the bulk of the officers who have received quick promotions under Xi used to serve in the former Nanjing Military Region (NMR), which covered Fujian and Zhejiang, where Xi worked from 1985 to 2007. For example, the current Head of the Political Work Department General Miao Hua, Commander of the Land Forces General Han Weiguo, and the commander and commissar of the People’s Armed Police, respectively General Wang Ning and General Zhu Shengling, are all alumni of the former 31st Group Army, which was a NMR unit based in Xiamen, Fujian (Ming Pao [Hong Kong], October 22; Radio French International Chinese Service, October 14, 2017). It is possible that Xi’s ruthless purges of powerful cliques in the military, coupled with the favoritism which he has treated former offices from the NMR, could arouse resentment among PLA officers. Some the nation’s most prominent intellectuals are also chafing under Xi’s ironclad control over their freedom of expression. In July, several bold scholars, including Xu Zhangrun of Tsinghua University, veteran international relations expert Zi Zhongyun and financial commentator He Jiangbing put their careers on the line by laying into the current administration’s “comprehensive resuscitation of totalitarian politics” and its tendency to “embrace savagery and forsake civilization” (China Brief, August 1; Theinitium.org, July 24; Chinesepen.org, July 20). Since then, intellectuals’ criticism of Xi seems to have been muted, possibly due to pointed warnings from the Xi administration against offending men of letters. In August, the party’s Organization Department and Propaganda Department took the rare step of issuing a joint notice entitled “Circular on starting a campaign on propagating ‘the spirit of patriotic struggles and seeking accomplishments in the new era’ among the broad masses of intellectuals” (关于在广大知识分子中深入开展“弘扬爱国奋斗精神、建功立业新时代”活动的通知”; Xinhua, August 11), a clear shot across the bow of ill-disposed members of the educated classes.